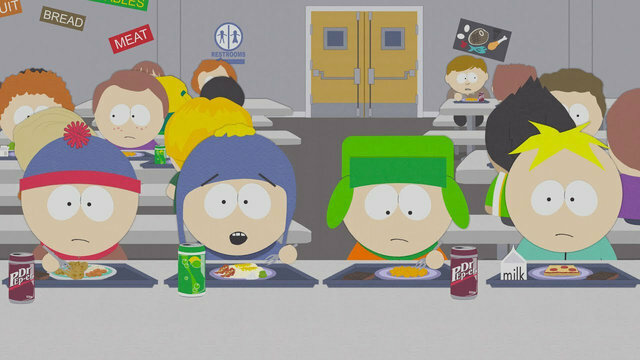 The following post contains spoilers from South Park's "Put It Down." After memorably parodying the president last year with a season-long arc, Matt Stone and Trey Parker said no more. But not even South Park can stick to its campaign promises. It turns out the little Colorado town and its inhabitants are still obsessing over the Donald Trump phenomenon -- specifically as it relates to Twitter. "AGGHHH!! !," Tweek said in last night's episode, expressing his feelings about the current political climate in North Korea with a frantic song. "We're all going to die! They have nuclear missiles! Why are you just sitting there? Doing nothing? We have to get out of here. North Korea wants to kill us all, and our President keeps making it worse!" Tweek tried to fix the problem himself by sending Kim Jong-un cupcakes, a sweet ploy rendered ineffective after President Garrison tweeted that Tweek shat in the batter. Chaos predictably ensued. North Korea began testing missiles above Tweek's house, mirroring the brinkmanship playing out in near-daily headlines. Rightfully so, Tweek panicked more. His boyfriend, Craig, couldn't convince him that his nuclear fears were irrational. Trips to amusement parks didn't help. Fidget spinners didn't help. His life became a living hell. Tweek wasn't alone. The adults of South Park also became so consumed by the president's Twitter they began tweeting while driving and flattening innocent students. It all made for a strong episode, one that had to have pleased old South Park fans with its self-contained premise and pointed message. What started as an episode generally poking fun at those obsessed with Trump pivoted into something aimed more at the commander-in-chief. After talking through his feelings, Tweek realized that he and the adults weren't at fault for the chaos around them -- people just weren't focusing their energy on "the right thing." So he rallied his friends to sing a more coherent song, a spoof of Logic's "1-800-273-8255" VMAs performance that begged heads of state to put their phones down and do their jobs. It's been clear ever since the campaign trail that Trump can't use Twitter in a way that separates the private person from the public professional -- something South Park underscored here as a distraction and, more seriously, a potential threat. "Put it down, don't be on your phone while being President," the town sang. "Put it down, you might do something dumb and cause an accident."